You probably don’t know this, but you made us. The first European to cross the continent and reach our Pacific coast was Alexander Mackenzie – a Scot. Our first prime minister and chief Father of Confederation, Sir John A. Macdonald? Scottish. So too our second PM. Our country’s national dream, a railroad from sea to sea, was realized in 1885 when Sir Donald Smith, head of the Canadian Pacific Railway, drove The Last Spike at Craigellachie – a place named after a village in his homeland. The man who did the most to create Canada’s system of universal public health care, and chosen as “The Greatest Canadian” in a national survey of CBC viewers, was Tommy Douglas. He was born in Falkirk. The thistle and the red lion rampant on our national coat of arms identify you as one of our four founding nations; half of our provincial flags contain a Saint Andrew’s cross; and one of our provinces – Nova Scotia – is named after you. There are said to be more pipers and pipe bands in Canada than in Scotland. And nearly five million Canadians identify their ethnic origin as entirely or partly Scottish, which means we have almost as many Scottish-Canadians as you have people. You made us – and as a gesture of thanks, we’d like to offer some advice on how to avoid unmaking yourself. This bit of history you are living right now? This referendum thing? We’ve already been through that. We may be a young nation but we have far more experience than you on this issue. We nearly tore our country apart. Twice. The independence side in your referendum campaign is to be commended for a few things. 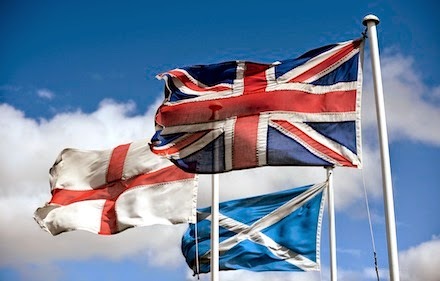 There’s no ethnic nationalism at the heart of the Yes movement, and that is no small accomplishment. And the question to be asked on the 18th of September – “Should Scotland be an independent country? – sounds remarkably clear and simple. The Quebec independence movement never dared ask anything so straightforward, because outright independence has never been favoured by anything close to a majority of the Quebec population. The Scottish question is shorter and simpler. But is it really clearer? It has not escaped the notice of us, your cousins from across the seas, that much of the case made by the Scottish Yes campaign is neatly described by our fuzzy 1980 question. “Sovereignty” but maintaining “an economic association”? Check. A new country, but also a plan to “negotiate a new agreement” with the old nation? Check. A Yes vote portrayed as promising co-operation rather than a severing of ties? Check. And the idea that you can leave but keep the currency? Sorry, we’ve heard this song before. The Yes campaign in Scotland, as reasonable as it imagines itself, seems to believe in the unreasonable proposition that you can improve your marriage by getting a divorce. It doesn’t work that way. The Yes campaign also promises that post-divorce negotiations will take place in an atmosphere of complete calm and rationality – and that rump Britain will give it what it wants. But that glosses over the fact that the other side has demands, too. Scottish First Minister Alex Salmond said recently that, if Britain didn’t let an independent Scotland continue to use the pound, Scotland might refuse to assume its share of the national debt. Mr. Salmond has the greatest interest in maintaining the fiction that normalcy will reign and reason will rule in the event of a Yes victory – and yet the mere mention of a hypothetical negotiation has even him testily making threats. How well do you think it will go if things move beyond the hypothetical? Having looked over the edge of the precipice that you are marching up to, and having dipped our toe into the volcano more than once, we can tell you: It will not go well at all. There is an alternative to independence: federalism. It’s something we’ve been practising and perfecting for a century and a half. You’ve been at it for a decade and a half. Give it time. We’re not sure if the “Devo Max” plans to devolve nearly complete responsibility for taxation to the Scottish Parliament, plans being floated by the British government in the final days of a referendum, are necessarily the way to go. But some devolution of taxing authority can take place. The Scottish Parliament has little power to raise its own revenues – whereas Canadian provinces have a full range of taxation and spending powers. That’s federalism. That’s how strong subnational and national governments can coexist. Once upon a time in Quebec, the independence option was the choice of the young, as it is in Scotland. That time has passed; most young Quebeckers today do not imagine that their very real economic and social challenges will be addressed by drawing a new border. But it took us a half-century to get to this point. The same can happen for you, too. So, dear cousins from beyond the seas, here is our advice and our plea: Stay in the United Kingdom. Let time pass and passions subside. Make changes happen, but within the U.K. And meet us back here in, say, 2040. You can take the U.K. apart then, if you still want to. We think you will not. And we know this: If you take it apart now, you can never, ever put it back together again.